Names Limited, a NNEP preferred vendor, has updated their offer to NNEP members. NNEP members can save $50 on their first order! First order FREE ($50.00 Limit). Names Limited specializes in heat press products for sports teams. Player Names, Numbers and Custom Art are available in a variety of ink and cad cut materials. Their ink player names are the least expensive way to put names on. Numbers are custom made when ordered so you are not having to buy numbers you may never need. Buy only the numbers you need for the current job. Custom transfers are available in up to 6 colors for $2.55 per color with a minimum of only 15 sheets. Name, Numbers and custom cut stencils are available for screenprinters. NNEP members – log in to the NNEP Members Only Blog for the details on how to save your $50! Use the email address on file with NNEP and your NNEP membership number to log in on the upper right of the page. The National Network of Embroidery Professionals is very pleased to welcome the entire team at ImprintsUSA to the NNEP Preferred Vendor Program. ImprintsUSA is a division of the Penn Emblem Company and offers its expertise as a “one-stop” supplier of sublimation inks, equipment, and blank imprintables. They partner with key industry manufacturers to provide small businesses and entrepreneurs with superior, cost effective solutions. Just as importantly, ImprintsUSA is dedicated to providing the technical support and information needed to enable its customers to be profitable and successful. Call ImprintsUSA today, for premium service with the most competitive pricing! NNEP Members - visit the NNEP member’s only blog or check your email for how to get your special member’s only pricing! Visit their website for more information, EmblemEdge.com. We just sent them an invitation to become a new preferred vendor with NNEP! Yep, it just happened, AGAIN – we sent a new customer to NNEP members! John Q Public called, actually her name is Pam this time, and she was in desperate need of an embroidery professional for an order of 60 items. “Could we help her find a good embroidery business that she could work with,” she asked. You bet we can! We sent an alert out to all NNEP members via the NNEP Exchange. We invited the NNEP members that were interested to follow up with Pamela, based on the details of this particular order. Talk about a win-win situation! Pamela needed some specific help, and we matched her up with NNEP members that have the right talent, the right equipment and the ability to meet her time frame. I just love it when it comes together like that, where we can connect people with need to NNEP members with the right capabilities. Can you guess what the product shown above is? Enter your guess in the comments below! 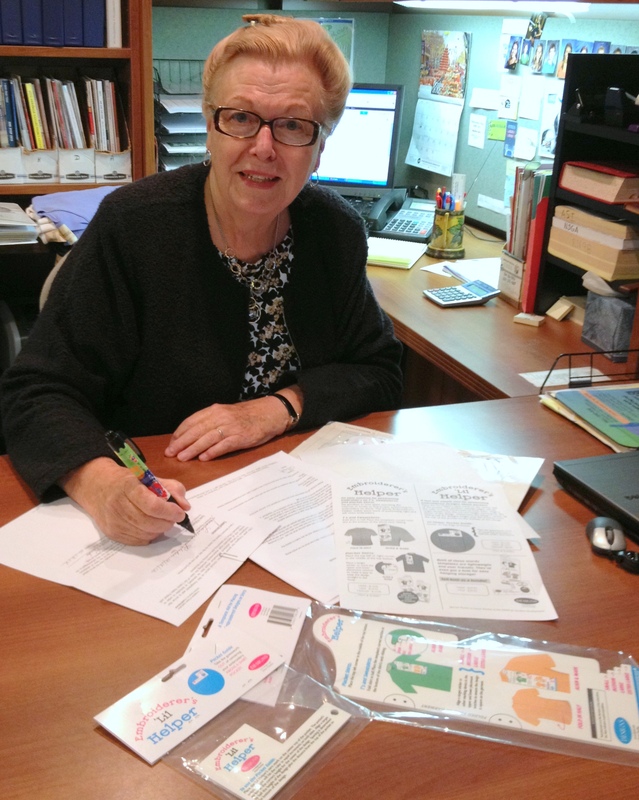 Susan Ritchie, co-founder of the National Network of Embroidery Professionals (NNEP) is signing the patent application for the Embroiderer’s Helper – Susan is listed as the inventor! Then Connie notarized it, and now on to the next step it goes – how very exciting! Brent Taylor of Durkee Hoops is the one who figured out how to take Susan’s idea, which has been used for over 20 years by many embroiderers, and turn it into a terrific, durable and affordable product. Nicely done Brent! This new hooping placement template will be available through Designs in Machine Embroidery soon. We will update you as the process moves along. 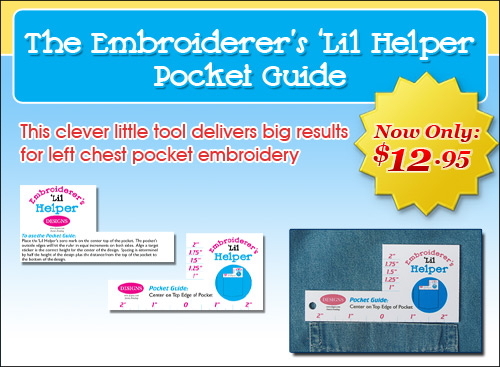 Order your Embroiderer’s Helper and Embroiderer’s ‘Lil Helper this week (through 11/30/12) and get free shipping! Stretchy headbands are selling well in many markets at the moment. 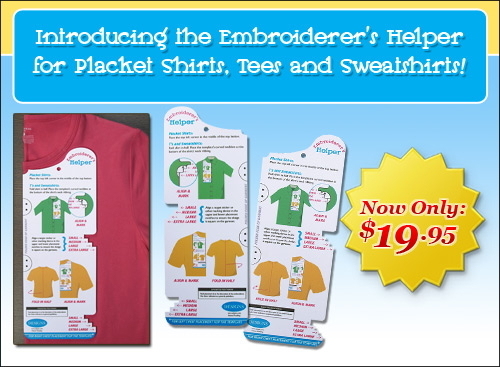 Embroider them or bling them with names, school names, team mascots, school colors, nicknames, clubs – just about anything goes! They are a quick, easy product to embellish and with low stitch or stone counts, you can turn good profits – that ever so wonderful combination! Young girls up through adults are wearing them, so think of design ideas that will span a wide range of ages, from tots to tweens to college co-eds to adults. I have even seen some guys wearing them to hold back their long locks (I think most of them were soccer players). These products come in a huge variety of colors, patters and styles. And if you do well with this hair accessory, consider adding others and creating a small display for some quick cash & carry sales. NNEP Members - check out the NNEP members only blog post here for some wholesale sources for these headbands and other hair accessories. Log in with your email address and current NNEP membership number. PS – Thanks Eva Meade of Modern Monogram for sending the image! I just met one of the owners of a company that has an innovative product that is a business card and becomes 5 golf tees! If you have customers that are looking for a unique promotional item, I would certainly add this to your bag of product ideas! Watch a VIDEO where Rich explains the product. Our customers are always looking for new, useful products that they can give away to their customers, right? And we all tend to gravitate towards promotional products with built in functionality. After all that is why pens and mugs top the charts as some of the best selling promotional products of all time! This is a business card with golf functionality. It is new, unique, functional – a great combination. 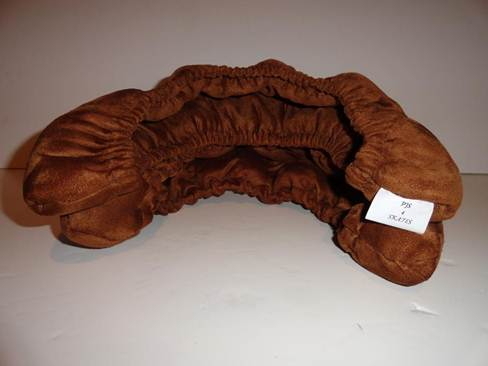 I have contacted the company for details about order minimums, delivery times, etc. I will add that info to this post as soon as it is provided. Sassi Designs, a new NNEP preferred vendor, has a great offer for NNEP members right now – 10% OFF wholesale! We emailed the details for this special offer to current NNEP members today. This offer is good through Sept. 1, 2012. If you did not receive it, please let me know so that we can update the email address we use to bring these specials to your attention! If you would like to take advantage of special deals like this, join NNEP today! We would love to help grow your dream business with great products, great information and great people. While attending the NBM Show in Indianapolis, I found a new source for fitness apparel and yoga apparel. The brand is Expert Performance. They have a variety of products that will work for your fitness-oriented customers and for any businesses in the fitness industry. The line is distributed by Sun Apparel. Check out their products online at http://www.sun-apparel.com/. NNEP Members – click here for the details on connecting with this resource as a wholesale account. While at the NBM Printwear show in Indiana, I learned something new about a company we’ve known for a very long time, Balboa Threadworks. Lee is now distributing a line of really nice rhinestone transfers, Isaac’s Designs. And they have taken the idea one step farther – they have a line of custom tops to go with their transfers. They feature a variety of “collar” designs that align perfectly with the necklines of their apparel. And Lee, in all her creativeness, is combining many of the rhinestone designs with her embroidered stock designs, which results in some rather spectacular combinations. Come check out what Lee is doing with these design ideas at the Embroidery Mart in Nashville in July.